MOSCOW, January 4. /TASS/. Two military servicemen were killed in the December 31 mortar shelling of the Hmeymim airbase in Syria by militants, the Russian Defense Ministry reported on Thursday. "On December 31, 2017, at nightfall, the Hmeymim airfield came under a sudden mortar fire from a mobile militant subversive group. Two military servicemen were killed in the shelling," the ministry said. Ministry also stated that reports on seven aircraft destroyed by militants at the Hmeymim airbase in Syria on December 31 are not true. 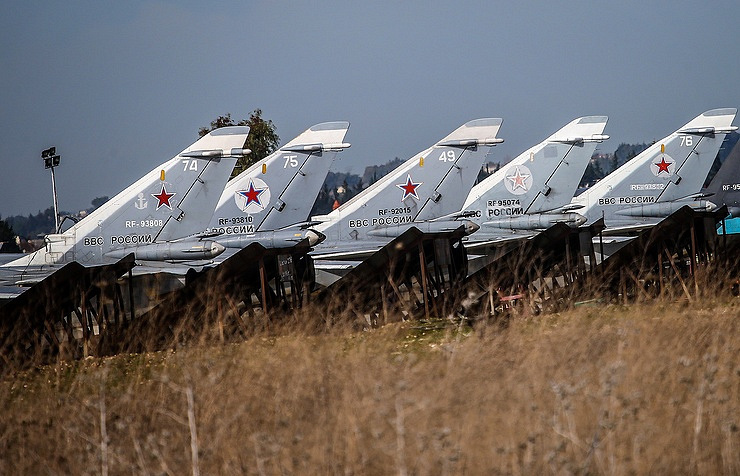 "A report in the Kommersant newspaper on the alleged destruction of seven Russian warplanes at the Hmeymim airbase is fake. Russia’s air group in Syria is combat ready and continues to accomplish all its missions in full," the ministry said. The Kommersant newspaper earlier wrote citing some sources that on December 31 militants from one of terror groups shelled the Hmeymim airbase with mortars destroying four Sukhoi Su-24 bombers, two Sukhoi Su-35S fighter jets, one Antonov An-72 transport plane and an ammunition depot. According to the paper, more than ten military servicemen could be injured. On January 3, the Russian Defense Ministry said that on December 31 Russia’s Mi-24 helicopter crashed due to a technical malfunction during a flight to Syria’s Hama airfield. Both pilots were killed in the crash. The ministry denied reports that the Mi-24 had been in the line of fire. On Thursday, the Russian Defense Ministry refuted reports on seven aircraft destroyed in Syria.